The last line shows how to pass constructor arguments to the Actor being created. The presence of a matching constructor is verified during construction of the Props object, resulting in an IllegalArgumentEception if no or multiple matching constructors are found. The first one is deprecated because the case class structure changed between Akka 2.1 and 2.2. The two variants in the middle are deprecated because Props are primarily concerned with actor creation and thus the “creator” part should be explicitly set when creating an instance. In case you want to deploy one actor in the same was as another, simply use Props(...).withDeploy(otherProps.deploy). The last one is not technically deprecated, but it is not recommended because it encourages to close over the enclosing scope, resulting in non-serializable Props and possibly race conditions (breaking the actor encapsulation). We will provide a macro-based solution in a future release which allows similar syntax without the headaches, at which point this variant will be properly deprecated. There were two use-cases for these methods: passing constructor arguments to the actor—which is solved by the newly introduced Props.apply(clazz, args) method above—and creating actors “on the spot” as anonymous classes. The latter should be solved by making these actors named inner classes instead (if they are not declared within a top-level object then the enclosing instance’s this reference needs to be passed as the first argument). It is a good idea to provide factory methods on the companion object of each Actor which help keeping the creation of suitable Props as close to the actor definition as possible, thus containing the gap in type-safety introduced by reflective instantiation within a single class instead of spreading it out across a whole code-base. This helps especially when refactoring the actor’s constructor signature at a later point, where compiler checks will allow this modification to be done with greater confidence than without. * @param name The name to be passed to this actor’s constructor. case "info" ⇒ sender ! "A"
case "info"   ⇒ sender ! "B"
case Terminated(`child`) ⇒ lastSender ! "finished"
To acquire an ActorRef for an ActorSelection you need to send a message to the selection and use the sender reference of the reply from the actor. 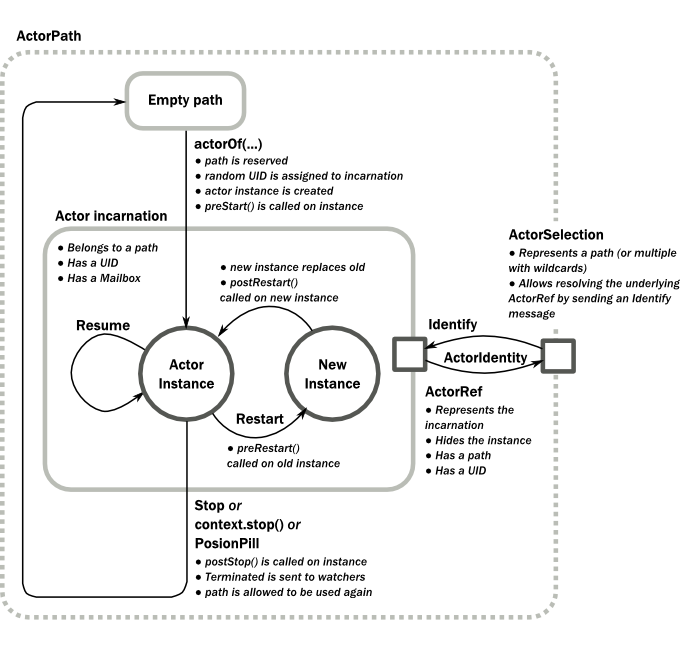 There is a built-in Identify message that all Actors will understand and automatically reply to with a ActorIdentity message containing the ActorRef. This message is handled specially by the actors which are traversed in the sense that if a concrete name lookup fails (i.e. a non-wildcard path element does not correspond to a live actor) then a negative result is generated. Please note that this does not mean that delivery of that reply is guaranteed, it still is a normal message. An example demonstrating actor look-up is given in Remote Lookup. If invoked from within an Actor, then the sending actor reference will be implicitly passed along with the message and available to the receiving Actor in its sender: ActorRef member field. The target actor can use this to reply to the original sender, by using sender ! replyMsg. Using ask will send a message to the receiving Actor as with tell, and the receiving actor must reply with sender ! reply in order to complete the returned Future with a value. The ask operation involves creating an internal actor for handling this reply, which needs to have a timeout after which it is destroyed in order not to leak resources; see more below. If you want to have a handle for replying to a message, you can use sender, which gives you an ActorRef. You can reply by sending to that ActorRef with sender ! replyMsg. You can also store the ActorRef for replying later, or passing on to other actors. If there is no sender (a message was sent without an actor or future context) then the sender defaults to a 'dead-letter' actor ref. case "foo" ⇒ sender ! "I am already angry?" case "bar" ⇒ sender ! "I am already happy :-)"
Invoking stash() adds the current message (the message that the actor received last) to the actor's stash. It is typically invoked when handling the default case in the actor's message handler to stash messages that aren't handled by the other cases. It is illegal to stash the same message twice; to do so results in an IllegalStateException being thrown. The stash may also be bounded in which case invoking stash() may lead to a capacity violation, which results in a StashOverflowException. The capacity of the stash can be configured using the stash-capacity setting (an Int) of the dispatcher's configuration. A bit advanced but very useful way of defining a base message handler and then extend that, either through inheritance or delegation, is to use PartialFunction.orElse chaining. case "foo" ⇒ sender ! "foo received"
case "bar" ⇒ sender ! "bar received"